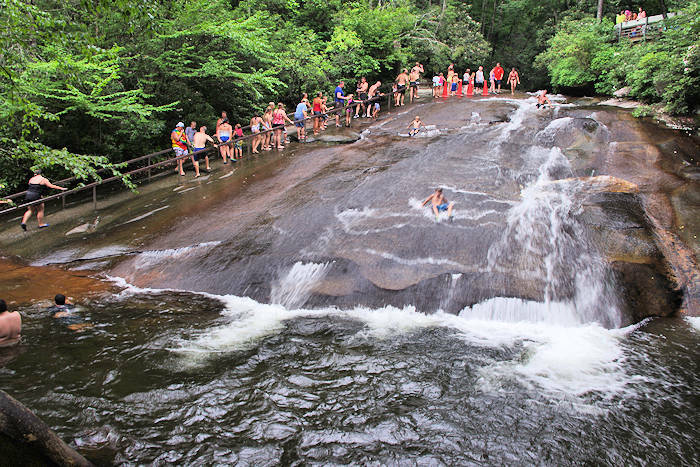 Upper Creek Falls is a beautiful setting with multiple cascades and a swimming hole complete with a rope swing for diving! 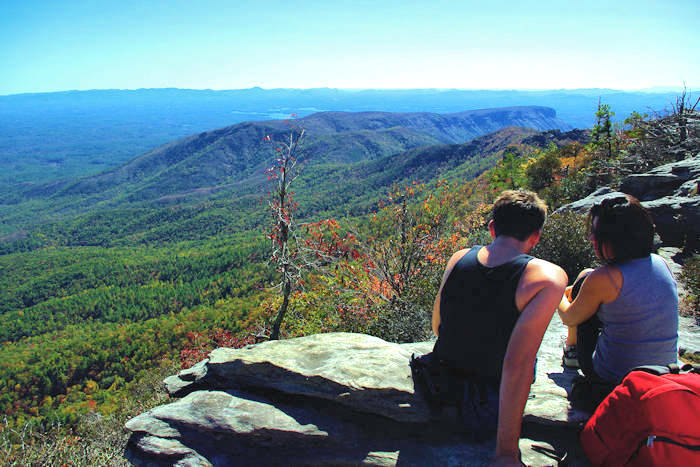 It's located in the North Carolina mountains in Pisgah National Forest along NC Highway 181 (near the small community of Jonas Ridge, about 13.5 miles north of Morganton) and about 5.5 miles south of the Blue Ridge Parkway. At the parking area, there are two options to start your hike on the loop trail. 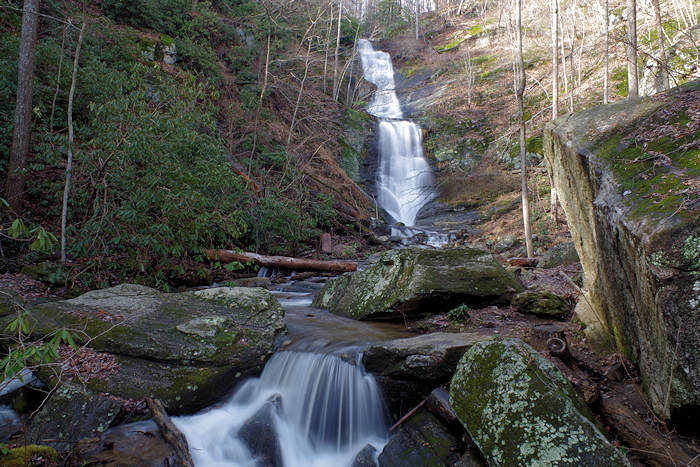 Take the Upper Falls trail first to a series of cascades dropping about 80 ft. along the rocky slope. The hike is 4/10-mile one-way with a downhill section near the water. After you descend a small staircase to the water's edge, you have three choices: turn left to reach the swimming hole (photo below); turn right for a view from the top of the main waterfall (bottom photo); or cross the creek to continue on the loop trail and get a better look at the main waterfall (photo at top). Depending on the flow of the creek, it will be a wet crossing! There are several spots to rock hop - but if the water is high, you cannot avoid getting your feet in the water. Of course, DO NOT attempt to cross the creek if the water is running too high. And wet rocks can be very slick rocks. If you don't want to cross, simply reverse your hike back to the car. If you continue across the creek, the 1.6-mile loop trail will take you downhill to the lower falls (series of small cascades - photo on right). Just after the crossing, you'll see some small side trails that take you to the waterfall edge, complete with rock boulders perfect for picnicking or sunbathing. Continue the trail downhill about a 1/2-mile to an obvious crossing (again, it's a wet crossing when water is higher) at "lower falls." Then hike uphill (about 400 ft. elevation gain) via switchbacks back to the parking area (wooded trail - no more views of the waterfall). Look for yellow blazes on trees to mark the trail. 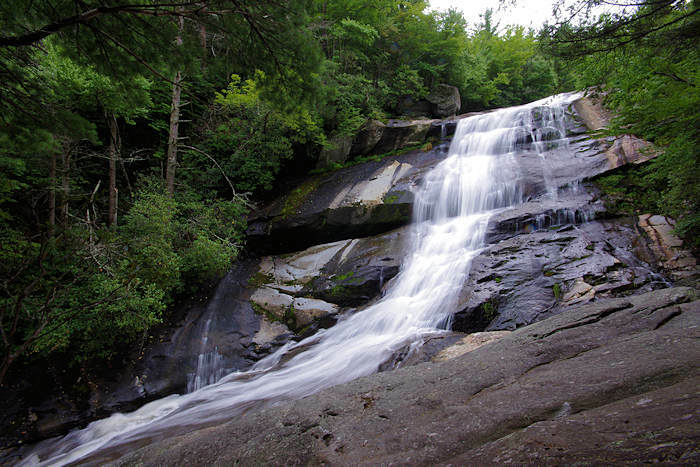 Nearby Waterfalls: Linville Falls (8 miles), Tom's Creek Falls (26 miles) and Elk River Falls (25 miles). Directions: Take NC-181 North from Morganton. The signed parking area is on the right about 6 miles north of the Pisgah National Forest boundary (and a few miles past the Brown Mountain Lights overlook). From the Blue Ridge Parkway, take Highway 181 south for 5.5 miles to the parking area on the left.